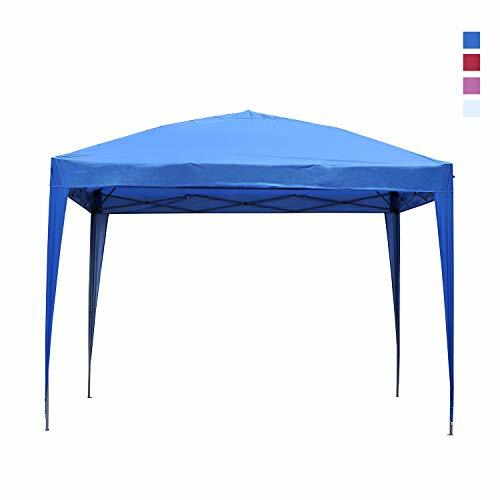 Specifications: Color: White Material: 180g high quality polyester fabric+ PA coating and powder coated steel poles Canopy size: 10'x10' Height: 8.5' Roller bag: Same color with the canopy Enjoy Your Outdoor Events With Sunnyglade Pop Up Canopy Tent The duty commercial grade 10x10 ft outdoor pop up canopy tent is perfectly designed to provide a large reliable temporary shade place for outdoor activities. 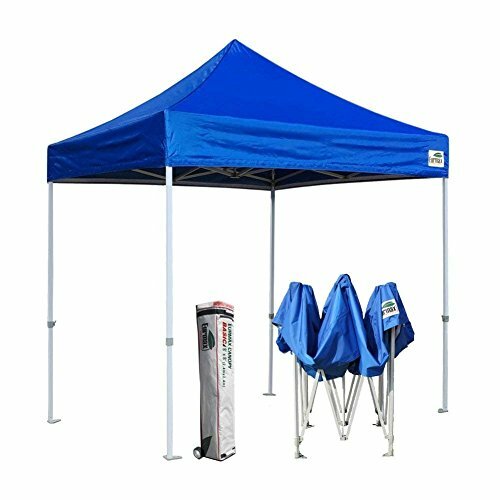 Pop up canopies are the perfect solution to keep your group of family or friends shaded during outdoor gatherings. It's also for sporting events, flea markets, trade shows. 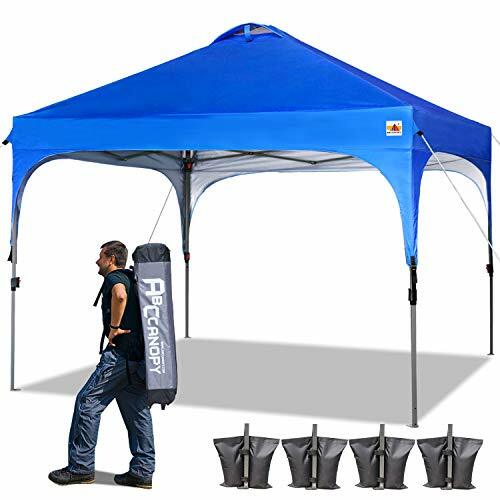 SUPER EASY TO INSTALL This canopy tent can be quickly erected by one or two person without any tools. Sun-RESISTANT Too much sun can take a toll on your skin. 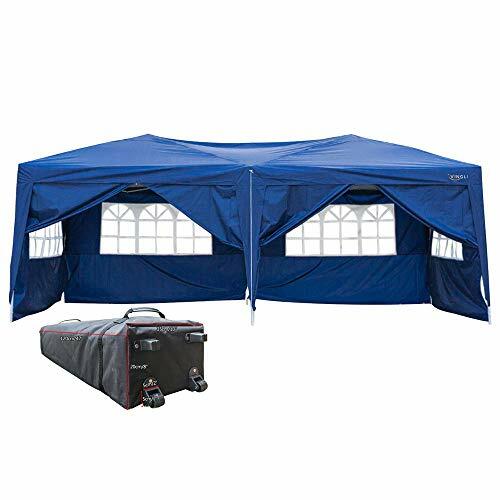 Protect yourself from the potential long-term effects of the sun with our 10-Foot canopy tent. It's the best shelter for outdoor events. AIR VENT There are Air Vents on the top for additional circulation. The difference: 1. Four steel feet have four stops for hooks, matching to the top cover with hooks 2. There is a velcro on the top for fixing the top cover. 3. There are fixed ropes at the four corners of the top cover. 4. Four steel feet have nails for fixing 5. The steel frame has three gears to adjust the height. Package include: 1. 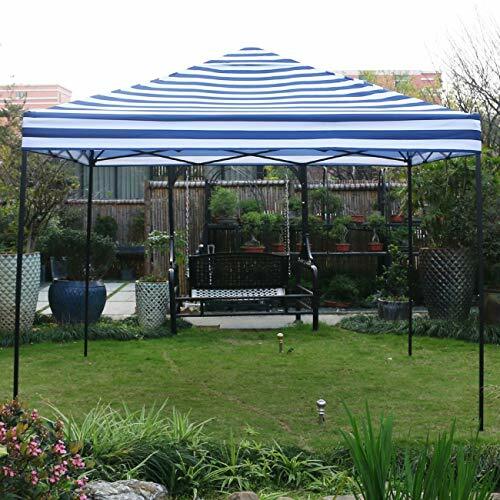 Foldable steel frame + Black hand bag + Canopy Tent Top Cover 2. For fixed:4pcs rope + 8pcs ground nail Note： 1.However, it is not recommended to use in the presence of wind or snow. 2.Please don't leave it outside for the night. 3.It takes only one minute to take it away. Have any questions, feel free to contact me. Have any questions, feel free to contact me. Feature: Frame: Steel frame (Black). Square shape legs. Rust & Corrosion resistant powder coated steel framework. Outer leg 30x30x0.8 mm Inner leg 25x25x0.8 mm Cross bar 12x25x0.5 mm Canopy Fabric: 200D PVC coated. 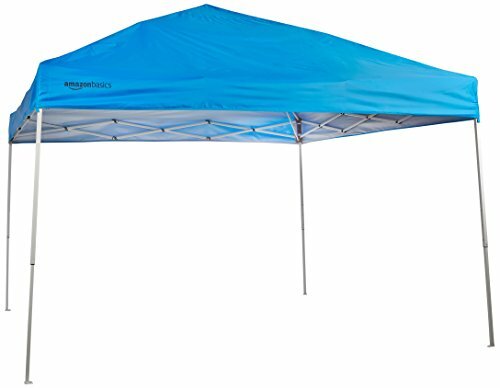 Strong & Light & Water resistance Push Buttons at The 4 Legs to Adjust to 4 Different Height Options Maximum Peak Height (4 Height Positions): 115"-118"-121.3"-124.4" Great for setting up at a park or in your own back yard. No tools necessary to assemble. Perfect for Arts and Craft Shows, Swap Meets, Flea Markets, Garage Sales, Fairs, Bake Sales, Camping, Picnics, Parties, Sporting Events... the possibilities are endless! Please Note: We advise customers to never leave canopy up overnight or under bad weather conditions. We will not be responsible for such weather damages. It is up to customers decision to determine the correct weather condition. US Stock, fast delivery. Shipping by USPS, FEDEX AND UPS. High quality guarantee: ISO 9001:2000 and ISO14001 standard-certified manufacturer. Features: 1. New and in a good condition 2. First-rate steel and 420D materials, fine workmanship and meticulous treatment 3. Easy to install and assemble 4. Won't take up too much space when it is folded 5. It is a sort of waterproof item, fit for outdoor use especially 6. Protect you from scorching sun light and rain Package Includes: 1 x Tent 1 x Carry BagNote: Please DO NOT USE the tent in windy and rainy days. It's very dangerous! Strong breeze may cause damage and hurt you. Storage it in carry bag when not using, good care make it service longer. 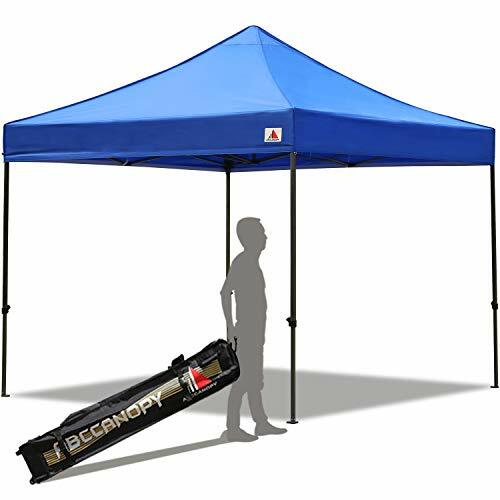 ABCCANOPY supplies a large varity of selections on ourdoor products such as pop up canopies, patio gazebos, party tents, garden parasols, durable marquees, umbrellas, table cover and related products such as canopy weights canopy walls, top covers and tent stakes, etc., which are with the best quality and the lowest price. For we have our own factory (spans 23,000 square metres), which enable us to cut all the middle chains and control the quality of each product rigorously. What's more, custom products (such as custom canopies, marquees, table covers, parasols and flags) are also provided with advanced printing technology. 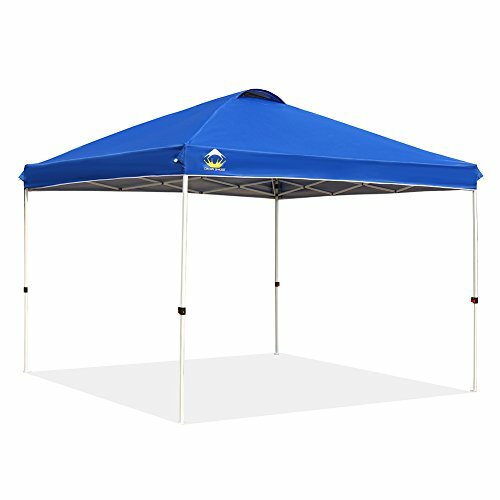 Canopy Tent are perfect for many outdoor needs. 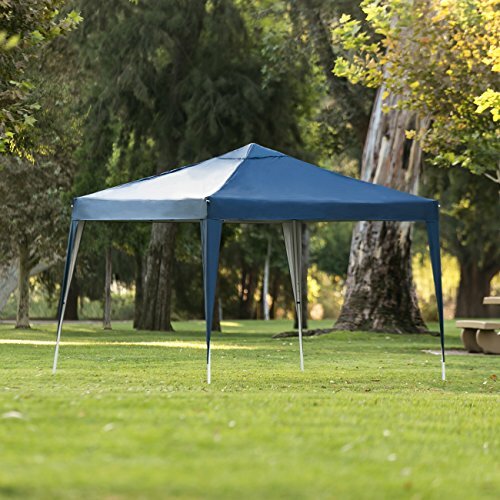 The gazebo is designed to provide you with the shade you need when you enjoy the outdoors on those bright, sunny days. Can be erected on hard surfaces such as driveways, decks, lawn, etc outdoor use. 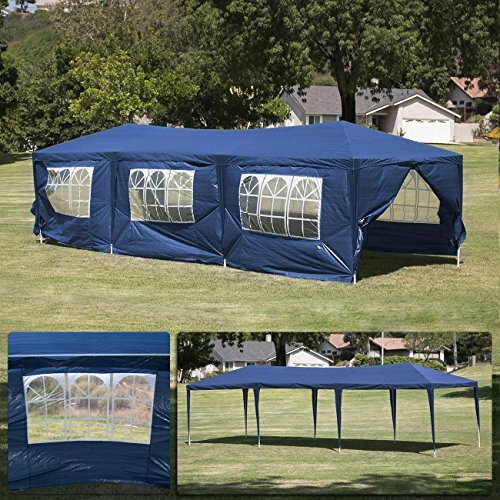 Ideal for commercial or recreational use - parties, weddings, flea markets, etc. 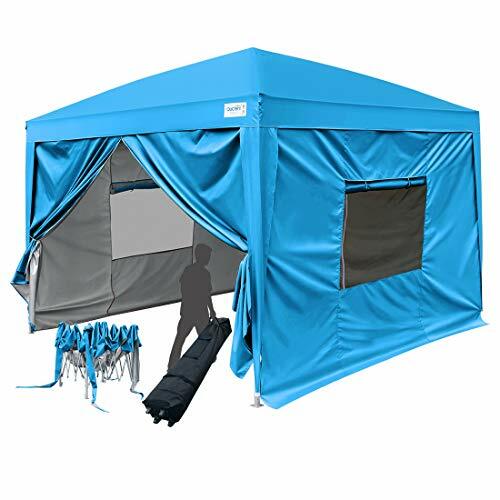 Features Great for Commercial use / Parties / backyard / events, etc Durable water proof polyethylene cover High strength joint fittings Blocks up to 90% of the sun's UV rays the canopy will keep you cool and comfortable Walls attach w/ Velcro fasteners for easily assembly/ removal Easy and fast to set up suitable for all kinds of events Sidewalls are easily removed for open air exhibits or outdoor events with overhead protection Comes with Ropes and Stakes for added Stability Rust & Corrosion resistant powder coated steel framework All Necessary Hardware Is Included Specifications: Material: Polyethylene Sidewall: 8 Frame: White Powder Coated Steel w/ PE Joint Fitting Overall Size: 10'FT x 30'FT Package Contents: Water Proof PE Cover Steel Tube Ropes Stakes (8) Removable Sidewall *Note* We advise customers to never leave canopy up overnight or under bad weather conditions. 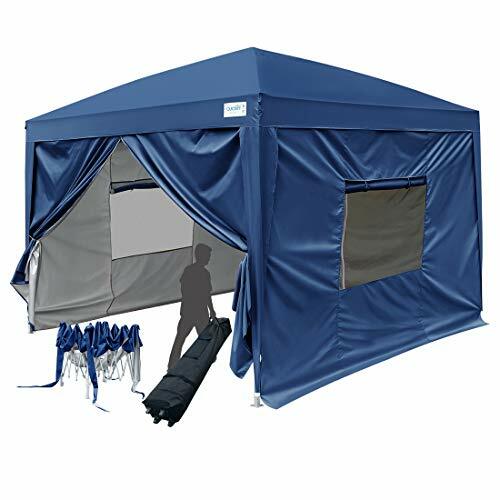 EURMAX BASIC CANOPY TENT Entry Commercial Level canopy tent. which combine the light weight and heavy duty. 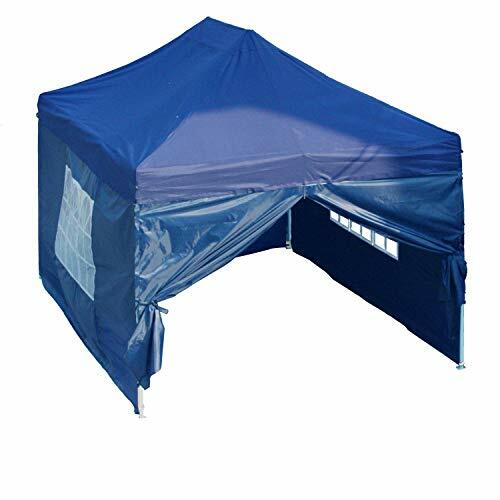 The basic 8x8 canopy tent can be quickly erected by one or two person without any tools. 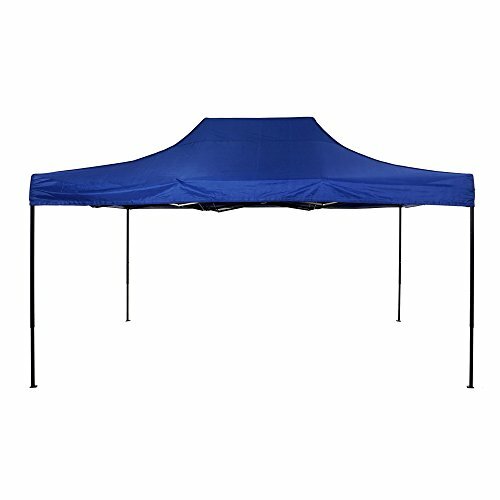 It is the canopy tent that you need for sporting events, flea markets, trade shows, a day at the beach or just shade on a hot summer day ! BRIEF DESCRIPTION Include: Frame + Canopy Top + Carry Bag. Fabric: 500D Polyester Meets CPAI-84 Fire Certification. WARRANTY Fabric and Carry Bag is covered for 3 months from time of purchase. 1 year limited manufacturer warranty on frame, depending on the model purchase. 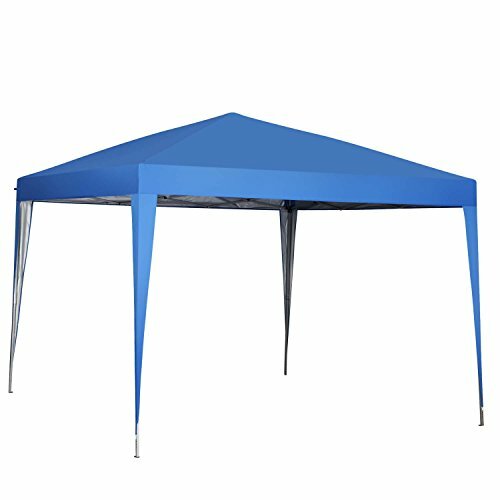 ABOUT US Eurmax has the largest selection on shelter product such as pop up canopies, gazebos, party tents, parasols and marquees. We are the high quality and low price leader. We cut all the middle chains and sell the best quality product directly to you with unbeatable price. We also supply custom canopies, custom marquees, custom table covers,custom parasols and custom flags. 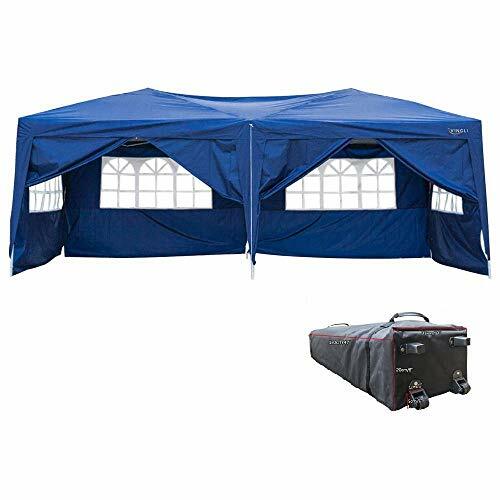 Don't Use Prolonged Rainy ConditionsInterior Silver Lining Coated Protect Sun RaysCanopy Tent Size Canopy Top 10x10 Ft Package size 46.8"*8"*8" Steel Pipe 24*24/19*19/9*17mm Weight 25 Lb Package Content 1.Canopy Tent Top Cover 2.Foldable Steel frame 3.Ground Nail Stakes and Ropes 4.Portable Carrying Bag Features 1.Instant Setup and Take down,Portable,Sturdy and Durable Indoor and Outdoors. 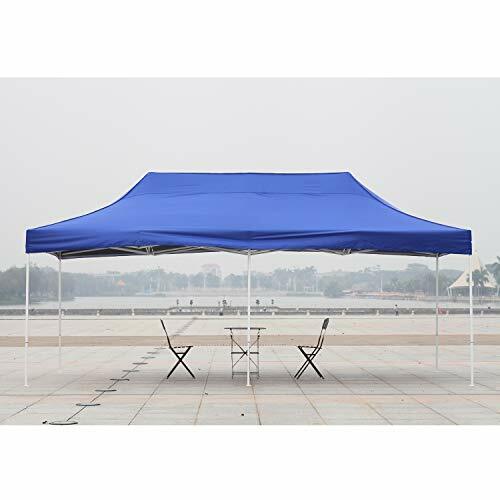 2.Tent Cover Water-Resistant and Against Sun Harmful Rays. 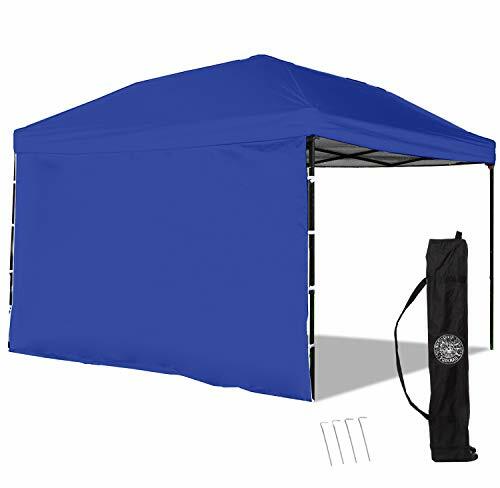 3.Include Portable Carry Bag More Easy For Outdoor Move Weather-Resistant 1.Protect From Sun Exposure And Block UV Rays,Offer Comfortable Cooling Shade 2.Instant Shelter Gazebos for Drizzle,Light Rain Attention For Use 1.Don't Use Prolonged Rainy Conditions,Rain,Snow,Wind Will Do Damage to Shelter Canopy Tent 2.If Rest on Beach or Use in Freeze Day We Recommed Buy Weights Bags for Tent Corners 3.Include Ropes and Ground Nails Can Offer Extra Sturdy Strength Multipurpose Good Idea For Craft Fairs,Street Festivals,Picnics,Tailgate Parties,Sporting Events,Backyard,Picnics,Porting Events,Parties,Vendor Shows,Farmer's Market,Family Outings,Weddings,Grill,Camping Trips,Dinner, A Day at the Beach,Backyard Barbecues,Patio,Small business,Trade shows,Hiking,Gameday & Tailgating etc. US Stock, Fast Delivery. Shipping by USPS, FEDEX AND UPS. High quality guarantee: ISO 9001:2000 and ISO14001 standard-certified manufacturer. 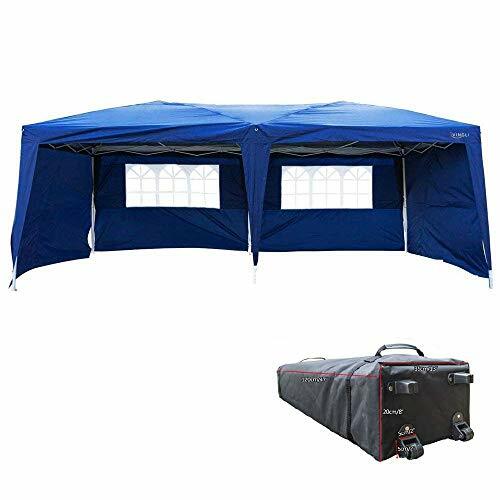 VINGLI 10' x 20' instant pop up canopy tent with 6 removable sidewalls features ① Superb high quality 420 denier material that is far better than others' ② Patented cross bar steady construction for steadier purpose ③ Double line sewing for withstanding wear and tear ④ Six removable sidewalls panel ,waterproof ⑤ Solid and durable rust resistance powder-coated steel frame, ⑥ 3 different height meet your needs. 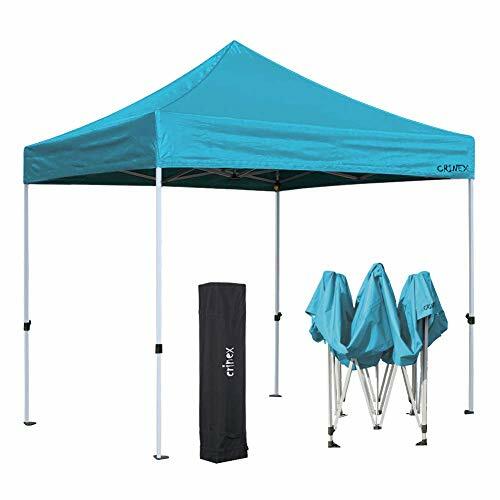 ⑦ Portable and store conveniently Package Includes: 1 x pop up canopy Tent 1 x Carry Bag Note: Please DO NOT USE the tent in windy and rainy days. It's very dangerous! Strong breeze may cause damage and hurt you. Storage it in carry bag when not using, good care make it service longer. Specifications: Frame: Steel frame (White). Square shape legs. Rust & Corrosion resistant powder coated steel framework. Outer leg 30x30x0.8 mm Inner leg 25x25x0.8 mm Cross bar 12x25x0.5 mm Canopy Fabric: 200D PVC coated. Strong & Light & Water resistance Push Buttons at The 4 Legs to Adjust to 4 Different Height Options Maximum Peak Height (4 Height Positions): 115"-118"-121.3"-124.4" Great for setting up at a park or in your own back yard. No tools necessary to assemble. Perfect for Arts and Craft Shows, Swap Meets, Flea Markets, Garage Sales, Fairs, Bake Sales, Camping, Picnics, Parties, Sporting Events... the possibilities are endless! Please Note: We advise customers to never leave canopy up overnight or under bad weather conditions. We will not be responsible for such weather damages. It is up to customers decision to determine the correct weather condition.